Have dinner on the table in 30 minutes. Basil, oregano, salt, pepper to taste. Give the lentils a quick rinse and then add to 1 1/2 cups of boiling water, simmer until the lentils are tender. Saute onion and garlic in a little olive or coconut oil. Add the grated carrot and cook until softened. 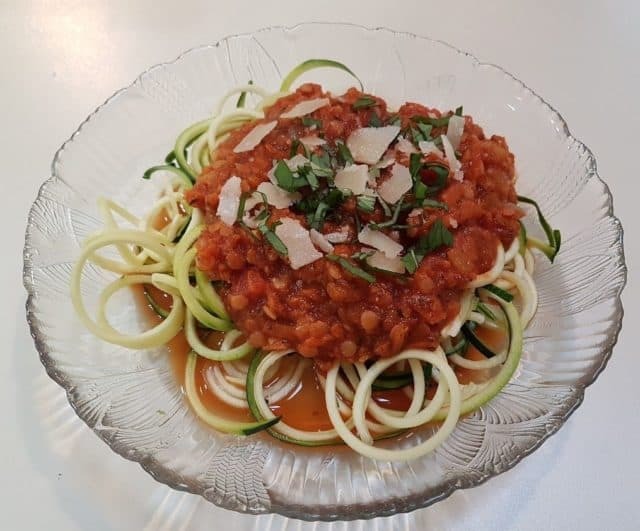 Serve over your choice of spiralized zucchini noodles (raw or lightly steamed), cooked spaghetti squash, or traditional pasta. Sprinkle with a little fresh basil and parmesan if desired.